Pest description and damage Pine needle scale are elongate, pure white scales with a cast larval skin at the narrow end. Males are smaller and more elongate. Red eggs are laid beneath the female scale cover. Crawlers are yellow and flat. Nymphs and adults feed on the needles. Heavily infested trees may appear crusty white or "flocked." Infested needles turn yellow, then brown. Twigs and branches may be killed. 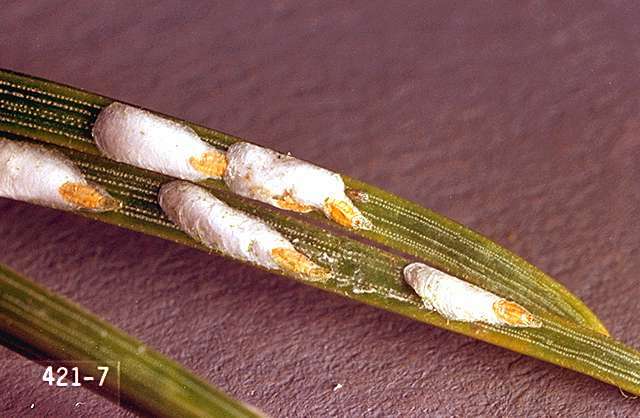 Repeated infestations eventually may kill plants. Pine needle scale is often found with the black pine leaf scale, which is convex, black with gray margins and a central yellow area. 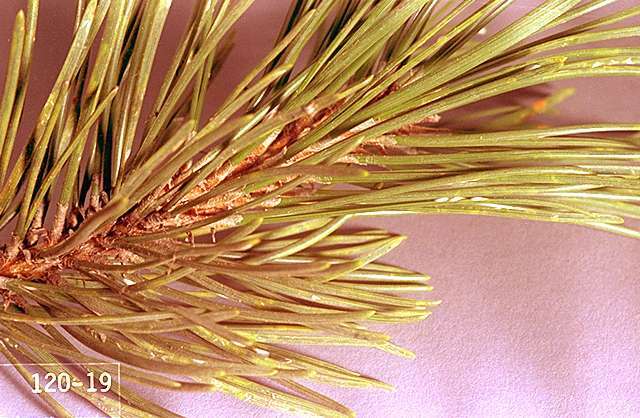 Pine needle scale is most serious on ornamental pines that are under stress or along dusty roads. This insect may infest arborvitae, cedar, hemlock, spruce and Douglas-fir. The female juniper scale is shaped like a small round volcano with a yellow top (cast off crawler "skin"), while the males are elongate with the cast skin at the narrow end. Crawlers are bright yellow but fade to tan as they begin to form the scale cover. There are two generations per year. Biology and life history The pine needle scale overwinters as red eggs under the female scale covering. Eggs hatch in spring and reddish crawlers move along needles and molt, becoming yellow with a dark central spot. A second generation occurs in mid-summer (July). Black pine leaf scale eggs are laid in June and hatch into crawlers in July and spend winter feeding on foliage. There is one generation per year in Oregon. Juniper scale overwinters as eggs beneath the female scale cover. Eggs hatch in spring and the pale yellow crawlers move to the last season's needles. Once females settle, they will remain in that spot.